Finding the right contacts for you is not difficult, especially if you know where to look. If you have been buying contact lenses for a while, you know there are many brands online to shop from. If you’re a new user, it can be confusing when faced with the different styles, colors, sizes, and other nuances. For this reason, we have written this guide to help beginners buy the best contacts for their eyes. In this guide, you’ll learn about the different contact lenses, how to prevent problems when wearing contacts. And most importantly, where to order your contacts online. There are many different types of contact lenses that you’ll come across. These are daily disposable soft lenses, 2-week disposable lenses, and monthly disposable lenses. Daily Disposable soft lenses are those contacts you wear for a full day and discard before the next day. They are the most expensive in the group, but they also are the most hygiene. There’s nothing better than the feeling of looking forward to fresh, new contacts every morning. If you are concerned about safety and about maintaining a healthy eye, they are the best option. They need to be sitting just right in the eye for you to have good, clear vision. Your first pair may be a little off, but that’s not something you should worry about. Your eye doctor may just need to adjust the thinness. And hard, hybrid and rigid contact lenses are a great alternative to soft contact lenses in certain types of situations. 2-week disposable lenses are lenses that you can wear for 14 days before you replace them. Usually, they are thicker than daily contact lenses and are also cheaper. They are not as popular as daily disposable lenses. However, are a good option if you are looking for a cheaper alternative to daily contact lenses. Monthly disposable lenses are the cheapest in this group. However, you don’t need to dispose of them as frequently as daily or 2-week disposable lenses. This is why they are the most vulnerable to eye infections. Health-wise, they are safe to wear. But you have to keep strictly to the schedule if you don’t want any problems. Astigmatism is a common vision problem that causes blur, shadowing or doubling of images. If you have astigmatism and want to use contacts, your eye doctor will likely prescribe a Toric soft contact lens. Hybrid contact lenses (which has a hard center and a soft contact lenskirt). 1. Soft contact lenses are the most frequently used because of their widespread availability, good initial comfort, and convenience. These lenses are disposable and available in daily, 2-week and monthly lens options. When it comes to correcting astigmatism with soft contact lenses, your eyeglasses prescription is an initial starting point. 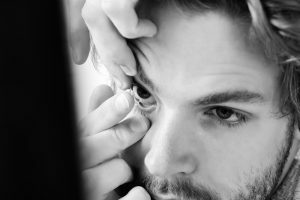 Once the contacts are in, it may take some time for them to settle into place. Your doctor will closely examine these lenses in your eye to make sure proper alignment. 2. Gas permeable contact lenses. Unlike soft contact lenses, Rigid Gas Permeable (RGP) contact lenses can maintain their shape on the eyes. They have been instrumental in slowing down the development of nearsightedness in both adult and young lens wearers. Also known as gas permeable contact lenses, they contain Poly Methyl Methacrylate. You should be careful not to confuse them with traditional hard contact lenses. They offer excellent eye health because they don’t harbor bacteria and can resist deposits because of their non-water content. Before wearing your contact lenses in the morning, make sure you wash your hands thoroughly. And dry with a paper towel before taking out your contact out of the storage case. If you are using 2 weekly, monthly or extended wear contact lenses, you need a cleaning solution. Before putting them on in the morning, clean them with the solution for 15 seconds. Then rub them in a circular motion and make sure you inspect the lenses before putting them in. Check for rips or tear and avoid putting them in your eyes if there is a tear. Then clean your case after putting your lenses in and empty out the old solution (try to do this regularly). Rinse lens case thoroughly with a solution and don’t forget to leave them open-up to air-dry. It is also important to change your case with every new bottle of solution. When it’s time to take your contacts out, you’ll need a storage solution. If you don’t already have, consider that there are different options for storage. This includes multipurpose and Hydrogen Peroxide Based storage solution. When you are dealing with contact lenses, there are a few things you shouldn’t do. Doing them may have some consequences such as vision loss or infections like papillary conjunctivitis. You also want to make sure that you take proper care of the contact lens case. Once you take out the contact lenses, pick out the case and allow it to dry during the day. Replace them with new fluid in the evening. Also, make sure you change to a new case every six months. This is because bacteria and other things can build up on the inside of the case and lead to infection. Probably the most important thing is if the contact lens is bothering your eyes or causing redness. Take them out and leave them for a month until your eyes start feeling better. And if they don’t start feeling better, then it’s very important to see your eye doctor. Listen to your eyes and they’ll let you know if there are problems with the contacts. In this section, we’d like to explain ways that you can prevent problems from your contact lenses. Wondering what you can do to help prevent ulcers from wearing contacts, this will be useful. Of course, sleeping in contacts gives more than 400% greater chance of an ulcer or a serious infection. But in addition to this, there are several other things that you can do to help prevent problems. Fitness: First of all, make sure with your eye doctor when you first start wearing contact lenses that they fit and move properly on your eye. Proper Schedule: Next, make sure that you change them according to the schedule. You can use some contacts for two weeks, some daily, and the others for a month. When you wear contact lenses beyond this approved time, the contact lenses lose their breathability and their flexibility. You might get into trouble if you make them go too long. This can be hard to remember sometimes especially if you are wearing monthly contact lenses. A way around this is to start on the first day of the month. So, if you forget on the first, you can change it the second or the first week of the month. You at least know that at the beginning of the month, you are should change your contacts. . Monthly contact lenses are reusable contact lenses which are great if you want a contact lens that you can use every day. 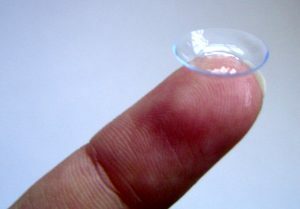 Because they’re cost-effective, you can use these disposable contact lenses every day or just occasionally. But you should throw them away at the end of every month. Monthly contact lenses are also available as extended wear which means that you can wear them overnight. If you like the monthly contacts, you should speak to your optician or learn more about them on our blog here. Daily contact lenses are disposable contact lenses that are a great option for anybody who wants to wear contact lenses either every day or just occasionally. You can wear them to the gym or you can wear them for an evening out or you can wear them all day long. They are available in a wide range of prescriptions that will suit nearly everyone. Daily disposables are also available in a range of silicone hydrogel materials and there’s no need to clean them. These contact lenses are something you simply put on in the morning and take them out in the evening, ready to wear a fresh, clean one the next day. The PureVision 2 Presbyopia Contact Lens is the breakthrough multifocal lens designed to deliver clarity where it counts in the real world and it’s all thanks to the new 3-zone progressive design which provides great vision at all distances. Because in today’s screen-centric world, you need clear vision near, far, and everywhere in between – whether you’re in a meeting at the office or enjoying yourself out on the town. Thanks to the thin-rounded edge, you’ll get the lasting comfort you want and need. PureVision 2 Presbyopia Contact Lens from Bausch + Lomb is a revolutionary new lens that can replace distance and reading glasses for up to 30 night and days. This is achievable due to the contacts allowing up to six times more oxygen to reach your eyes than ordinary contact lenses. They have a 3-zone Progressive design for improved clarity at near, intermediate and distance view. The contacts have good modulus and are easy to handle and insert. This lens is an extended lens, which allows the flexibility of sleeping with the lenses for a number of nights. This is also possible due to the high level of oxygen which is permeated by the PureVision2 for Presbyopia contact lens. PureVision2 for Presbyopia uses High Definition optics for clear, crisp vision and with the ComfortMoist Technology and thin lens design, you will be able to enjoy comfortable insertion and all day wear. The 36% water content gives good hydration and a visibility tint that treats you to an easy view of the lens inside the case. The PureVision2 for Presbyopia uses a multifocal design with great stability for contact lens wearers with presbyopia. Dailies Total 1 is the first of a new generation of contact lenses that were designed to alleviate the problem of lenses drying and causing ocular discomfort. CibaVision have achieved this with the introduction of a revolutionary new lens material. This material comes with a water gradient design. 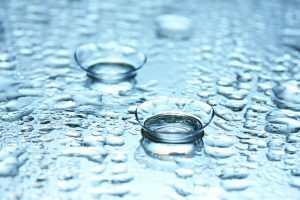 This means that the outermost surface of the lens comes with just the right amount of wetness that matches the natural water content of the cornea while the center has a lower water content to maintain stability and comfort. This revolutionary lens start with a highly breathable silicone hydrogel core with a low 33% water content allowing the lens to have a high dK/T of 156. A hydrophilic polymer network is embedded into the core, creating an extra soft gel with essentially no silicone and an average water content of over 80%. And at the outermost surface, extended water-loving polymer chains enable the water content to approach 100% water. 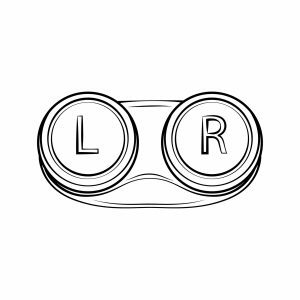 These loosely cross-linked polymers help the lens maintain outstanding lubricity until the end fo the day. It’s the world’s first and only water gradient contact lens with an increase from 33% to over 80% water from the core to the surface. The result is the lens that delivers superior breathability for a whiter, healthier-looking eye and lasting lubricity for unprecedented comfort that even at the end of the day is rated in excellent percentage. The Dailies Total 1 Contact Lenses is comfort redefined for lens wearers. The Acuvue Vita’s unique properties enable an integration of optimal amount of lipids while maintaining a low deposition profile. These integrated lipids continue to perform their natural beneficial function of helping to reduce evaporation and working with PVP to help maintain lens hydration all month long. 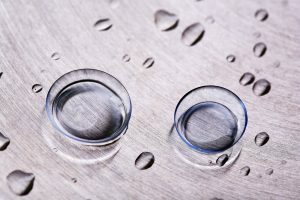 To ensure that this lens does maintain hydration all month long, the company then developed a model to test evaporation of moisture between the Air Optix, Aqua Biofinity, and Ultra contacts. After 30 days of daily wear, the evaporation rate of the ACUVUE® VITA™ with HydraMax™ Technology was 33% lower than the evaporation rate of the next closest lens. 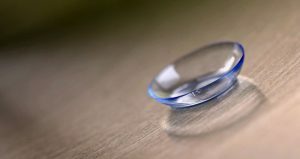 It can be hard finding a contact lens for extended wear that offers enough capability for a healthy use throughout the period you intend to use them. However, the ACUVUE® VITA™ with HydraMax™ Technology is different in that it is designed to maintain ample moisture for the period of its wear cycle – which in this case is 30 days. This contact lens actually combines hydrating agents with the pure Polyvinyl Pyrrolidone (PVP) to provide a long-lasting wettability. And the optimal density and distribution of lipids from the tear film assists in keeping the lens moist and comfortable on the eyes, thus bringing about whiter, healthier eyes. The 1-DAY ACUVUE ® MOIST Brand MULTIFOCAL has uniquely optimized optical designs which were individually engineered according to age and refractive range to address the needs of presbyopia. 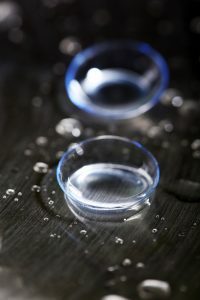 These contact lenses use a unique back surface to ensure saturation of the contact lens. The spherical center matches the natural corneal shape of the eye, maintaining the shape of the cortex front surface optics while maintaining the spherical periphery keeps the lens in place. The unique shape of this lens ensures that it stays in place while properly aligning the optics over the pupil delivering high fitting success across. The lens power added also help to combat the contact lens-related dryness and decreased tear production that comes with presbyopia. This lens was built on The 1-DAY ACUVUE ® MOIST Brand MULTIFOCAL to provide long-lasting comfort. Dual-action technology helps reduce lens dryness by keeping moisture in and help support the ability to keep the irritation out from The 1-DAY ACUVUE ® MOIST Brand MULTIFOCAL. If you are looking for a visual care solution that allows you to better address your vision fit and comfort need of the presbyopia condition, The 1-DAY ACUVUE ® MOIST Brand MULTIFOCAL can provide a continuous excellent care as your vision evolves into presbyopia. Colored contact lenses for light eyes: You can change your appearance in a subtle way by choosing the lens color that defines the edges of the iris and helps bring out the natural color of your eyes. Enhancement colored contacts are the best to achieve this, so choose one of them if this is what you are looking for. However, if your eye color is blue, you should choose a green or gray colored contact lens as that will overshadow your eyes color while blending with your appearance. Or you can choose a light brown or a warmly toned contact if you have light-colored eyes and a cool complexion. If you have dark eyes, you should go for opaque colored tints as that is suiting for those with dark eyes. And you can also try out hazel colored contacts if you are looking for a natural look or go for violet or blue to portray vivid colors that will help you stand out from the crowd. Did you know 1 in 3 patients sleep overnight in their contact lenses? An in-office compliance assessment was conducted involving approximately 2100 contact lens wearers from participating eye care practices across the US. It was found that 31% of patients sleep overnight in their contact lenses. 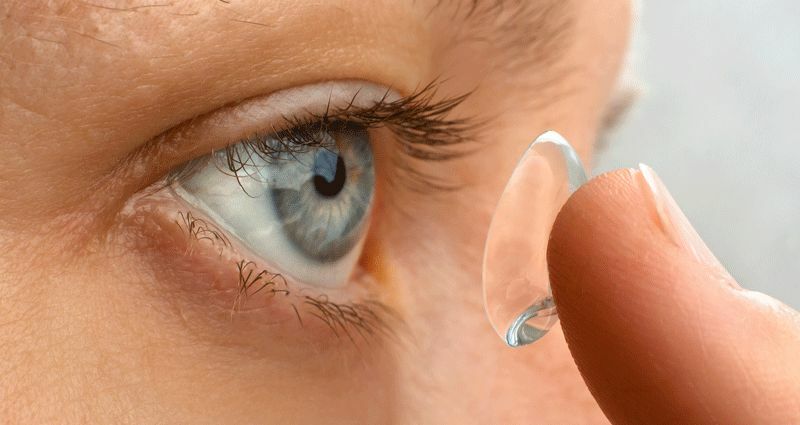 Another survey of daily and extended wear contact lens patients found that 47% of patients who sleep overnight in their contact lenses may not disclose they are doing so. Finally, a survey reported that 64% of patients who sleep 7 plus consecutive nights report wearing contact lenses not approved for this use. As you can see, many of the studies show that you shouldn’t sleep in your contacts unless it’s recommended by your optometrist. And when that’s the case, you need to ensure that the lenses you are using actually have that capability. If you have to do it, ensure you do it properly so it doesn’t have any negative side effect.